15th Century Africa comes alive in this African epic movie, « SANGO, THE LEGENDARY AFRIKAN KING (pronounced Shango). » A re-enactment of the life and times of a famous Yoruba King who ruled the old Oyo Empire, long before the arrival of the European slave traders to West Africa. African civilization pre-dating colonialism is highlighted in this 114 minutes feature film, depicting the life of the legendary Sango before he became king, his ascension to the throne, coronation, reign, love with the equally legendary Oya and of course the historic face-off between Sango and his famous war generals. The film attempts to provide an answer to how Sango became an Orisha (deity or god), still honoured by people in the South Western part of Nigeria, as well as in Brazil, Caribbean, U.S.A. and the African diaspora. Alongside new-comers Wale Adebayo as Sango, and Bunmi Sanya, as Oya, Sango’s beloved wife, of mythical fame, « SANGO, THE LEGENDARY AFRIKAN KING », parades seasoned Nigerian artistes such as Rachael Oniga (Obba), Joe Layode (Elempe), Bukky Ogunnote (Osun, pronounced Oshun), Gbenga Richards (Samu), Laide Adewale (Agbaakin), Ayo Akinwale(Bashorun), Antar Laniyan (Olowu), Ola Tehinse (Balogun), Jimi Sholanke (Ghost), Albert Aka-eze (Eliri), Toyin Oshinaike (Oluode), Peter Fatomilola (Babalawo – Oyo), Chief Wale Ogunyemi (Lagunan), Kola Oyewo(High Chief), Kayode Odumosu(Tamodu), Doyin Hassan (Omiran), Mufu Hamzat (Biri), Remi Abiola (Iyalode), Florence Richards (Otun Iyalode), and Jumoke Oke-eze (Chantress). « SANGO, THE LEGENDARY AFRIKAN KING » was shot across ten villages in Nigeria at the following locations: Ikorodu, Epe, Lekki Peninsula, and Isheri in Lagos State; Igbeti and Ibadan in Oyo State; Ilorin in Kwara State; Ijesha-Ijirin waterfalls and Ile-Ife in Osun State. The cast strength was 5,000 local actors and villagers. 5 palaces were constructed, together with additional buildings and courtyards. Chief Wale Ogunyemi, (M.O.N. ), one of Nigeria’s foremost researchers and playwrights, was commissioned to write the script. Executive Producer/Director is Femi Lasode for Afrika’n Vogue, Even-Ezra Studios, Lagos, Nigeria. « SANGO, THE LEGENDARY AFRIKAN KING » is available on video cassette, Video CD, and DVD. plus African musical videos from Nigeria. Afrika’n Vogue, Even-Ezra Studios, is pleased to announce that Nigeria’s most popular epic movie, the much talked about African epic movie, « SANGO, THE LEGENDARY AFRIKAN KING » won the award of Best feature Film at the 1st Abuja International Film Festival, held in Abuja, Nigeria, in October, 2004. The movie also won the Best First Film of a Director at the Nigerian Film Festival held in Lagos, November, 2003. Before then, the African epic movie, « SANGO, THE LEGENDARY AFRIKAN KING » was selected to open the Minneapolis/St. Paul International Film Festival, USA on April 14 – 29, 2002. Before then the movie was shown at a 2 – Day African Film Workshop at the Centre of African Studies (CAS), School of Oriental and African Studies (SOAS), University of London, Russel Square, London, U.K.
Before then, at PANAFEST’99 in Ghana, the people’s movie, « SANGO, THE LEGENDARY AFRIKAN KING » was shown simultaneously on Friday Night the 30th of July 1999 at Cape Coast the main PANAFEST’99 venue. The next day « the people’s movie » was shown simultaneously at Accra, Takoradi, Kumasi and Koforidua. « Sango, the Legendary Afrikan King, is not new to Ghanaians. It was screened in 1998 at National Theatre, Accra, Ghana as part of Septemberfest’98 film festival. The epic film « SANGO, THE LEGENDARY AFRIKAN KING » continues to gain in popularity both abroad, and also at home. 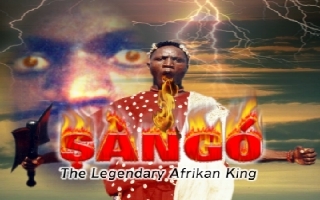 In 1999, the acclaimed epic film « SANGO – THE LEGENDARY AFRIKAN KING » was screened during the 7th Pan African Film Festival in Los Angeles, U.S.A, on 5th of February, and again on the 9th of February (due to popular demand). It was shown at private screenings in New York, New Jersey, Atlanta, Chicago, Minneapolis, and Seattle, all in the U.S.A.
Additionally, in 1998, « SANGO, THE LEGENDARY AFRIKAN KING » was screened by the Film Society of Lincoln Centre, New York, U.S.A. as part of the Fourth New York – African Film Festival. It was also screened at the Brooklyn Museum of Arts, and the Chicago Museum of Arts. « SANGO, THE LEGENDARY AFRIKAN KING » has been screened by Afro Hollywood to select audiences in London, England, while Liverpool audiences also got a chance to enjoy the movie. Back home in Nigeria, « SANGO, THE LEGENDARY AFRIKAN KING » had a successful outing on different University Campuses, colleges of Education as well as in Cinema houses nationwide. Most recently, it was screened for the then new Executive Governor of Lagos State, His Excellency Bola Ahmed Tinubu, at the historic Glover Memorial Hall, Lagos. The theme for the occasion was « The need to Document our History on film. » Subsequent to that, the movie opened to a large number of cinema-goers at both the National Theatre, Iganmu and the Glover Memorial Hall, Lagos for three weekends in July, 1999. In 1998, « SANGO, THE LEGENDARY AFRIKAN KING », was also screened at the National Arts and Culture Centre in Abuja for four days in 1998 to commemorate Nigeria’s Independence day. Earlier, the epic film « SANGO – THE LEGENDARY AFRIKAN KING » had broken box office records at the National Theatre, Iganmu, Lagos as the first English-speaking film to attract a massive turnout. The film which started showing at Cinema hall I between 1st – 3rd April, 1998, attracted an estimated crowd of over 1,800 people each day. On the 4th and 5th days of April, « SANGO – THE LEGENDARY AFRIKAN KING » had to be relocated to the Exhibition hall whose seating capacity is far greater than Cinema Hall I that was earlier allocated to it. On the 18th of September, that year, « SANGO – THE LEGENDARY AFRIKAN KING » had a critical screening in Lagos at Goethe Institute (Germany Cultural Centre) during the Germany Film Viewer’s forum. is produced by Afrika’n Vogue/Even-Ezra Studios. with emphasis on audio and video production. Even-Ezra Studios is an innovative audio-visual production and artiste management organization, whose major goal is geared towards pushing back the barriers confronting contemporary African art, music and projecting African culture, world-wide.